Liz Miller is an artist, printmaker and one of the main collaborators for the first manifestation of the project dontdrinkthemilk. Trained at Edinburgh College of Art and the University of the Arts London, Liz is in the midst of completing a two year print-fellowship at the Royal Academy Schools. She is a professional etching editioner for Huguenot Editions Original Print Studio and is a tutor at both the London Metropolitan University and Lavender Print School where she teaches etching. Her work is held by several collections including the Tate Print Collection and the British Library. For her involvement in dontdrinkthemilk#1 Liz will present her translation of the scores of Claude Debussy’s Clair de Lune and will collaborate with two musicians; Alexander Soares, a concert pianist, and Chester Lusk, a sonic artist. In the lead up to the event on the 14th of December I asked her some questions about her series Classics on Vinyl and her involvement in ddtm#1. Amy E. Brown: You work a lot with the idea of mapping, cartography, and I was wondering how you came up with the musical scoring system you use for your Classics on Vinyl series. Was it an intuitive thing or did it involve more technical aspects? 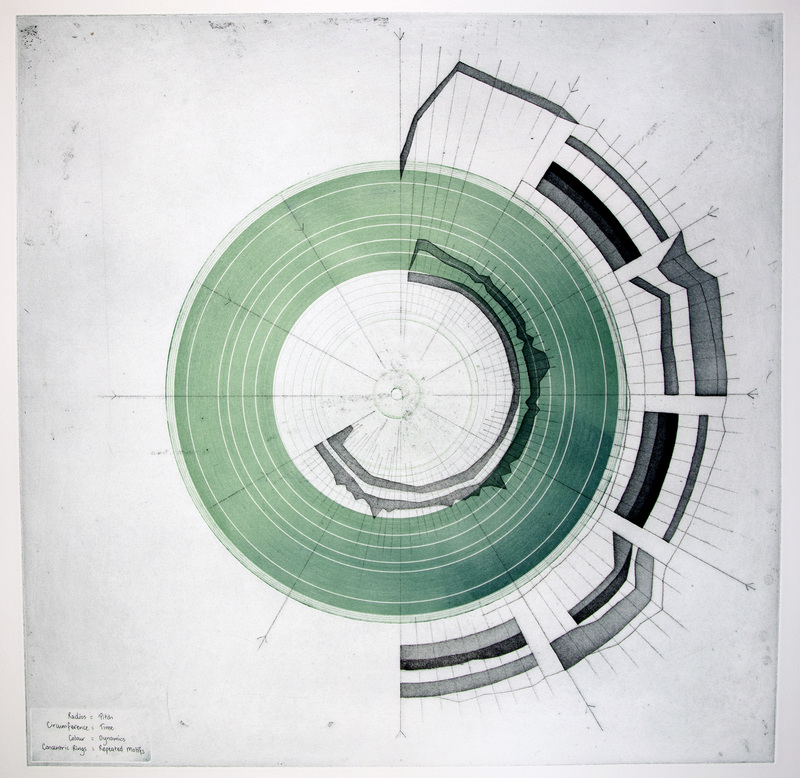 Liz Miller: For the Classics on Vinyl series I wanted to create a graphic score mapping system that showed aspects of music that traditional music notation doesn’t focus on. The repetitive nature of music interests me. The classical refrain, the chorus of a song returning again and again, even within the most obscure compositions I find myself searching for a motif that I have heard before. My notation system focuses on repetitive motifs within music. The score develops in a circular pattern and the repeated motifs expand as if the music were a cross section of a tree-trunk, with the ever-expanding rings growing out from the centre, each layer being directly affected by the one that preceded it. The technical aspects of the score took a lot of calculating and re-working. I wanted to get every aspect, like pitch, timing and volume dynamics perfect, so that the system is readable and learnable. For every piece that I make, I use both the original score and listen to the music over and over again. I listen out for when motifs repeat, how those repetitions vary, when a new motif is created and how this will all fit into the diagram. AEB: This cross-disciplinary approach works with a translative quality, almost as though the different media were different languages. Would you describe the works as translations and, if so, is the musical performance the natural next form of language to consider? LM: ‘Translations of music’ is a great way to describe my diagrams. My scoring system is like a new language through which music can be interpreted. The performance of the score is essential. It is definitely both an audio and a visual experience. AEB: Is this the first time that this series will have a live performance of your scores? LM: This is the first live performance of the Debussy – Clair de Lune series. It’s been a long time in the making, and I’m really excited to be collaborating with two musicians for its debut performance. AEB: The Classics on Vinyl series is something you describe as a “cross-over between music and visual art”. Where do you feel the borders of these pieces lie; in the prints, the process, the performance or a combination of all of these things? 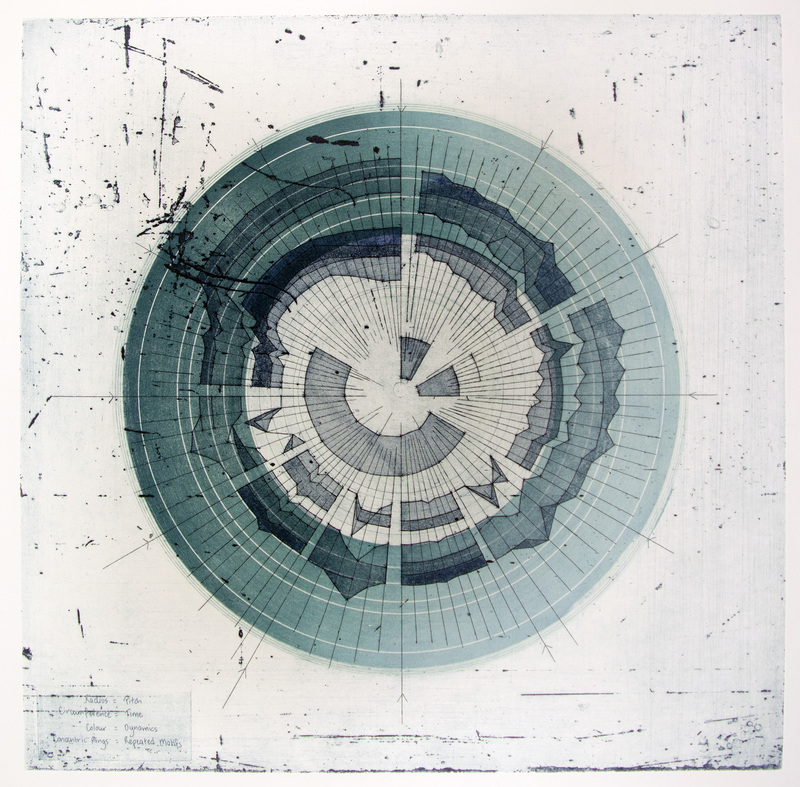 LM: By trade I am an etcher, and my music mapping prints are a homage to the classical tradition of etching, yet they are only half the experience of the artwork, the performance of the music maps, the combination of the audio and the visual, is the true whole experience. AEB: If the pieces are to be read intuitively and rendered unrecognisable as the original score, how would you name them? For example, would they all be “Clair de Lune” or would they be something else entirely? LM: Currently I am directly referencing the original piece of music in the title of each piece to aid understanding of what I’m making and trying to achieve with the series. This may change as the project develops. It will depend on: whom I collaborate with; in what direction the collaboration goes; and how much reference to the original score is required. AEB: You are collaborating with two others, Alexander Soares and Chester Lusk, Alex will be performing the original score which he will read from your own score. How do you feel his performance will contribute to your work? LM: I’m so pleased that Alex Soares will be performing at dontdrinkthemilk#1, I couldn’t have asked for a more talented, open-minded musician to collaborate and experiment with. Not only will he be able to represent the original score in its truest form, but he can also read my score with ease. The audience are in for a treat! I’m really looking forward to this performance at the event. AEB: Do you feel it is important to have a presentation of the original score? LM: I’m interested in the progression from original score and traditional performance, through to re-interpreted score and brand new composition. In order to show the full discourse and development of the project, I think it’s important to present the piece as it was originally intended to be performed, before continuing with the re-interpretation and metamorphosis of the music. AEB: In direct comparison to Alex, Chester will produce his own digital rendition of your score, one which will not adhere to the original composition, but will be an intuitive read of the piece displayed on the night. Do you feel that this is a progression, or finishing, of this particular work, or is this something that you see yourself returning to? LM: This event will be the finished set of work for this particular piece of music. Chester Lusk’s new composition is a really satisfying way to conclude the Debussy – Clair de Lune series. However, I am very interested in further collaborations and developments of the project for other pieces of music and other sound based work. AEB: Where do you see Classics on Vinyl ending or is it something you see as an evolving form where it doesn’t end, but simply changes shape and goes on? LM: I definitely see the project continuing and evolving. I would like to experiment with different genres of music, perhaps try to tackle multiple instruments within one score or even develop into other sound based projects that aren’t necessarily musically based. I’m interested in moving image and how that will change the mapping process.